Turbulence is something that happens nearly every time you fly, whether you fly commercial or private. And every time it happens, it can be a little scary. Turbulence is one of the reasons that a fourth of all Americans are at least a little nervous when it comes to flying. So what is turbulence, why does it happen, and is it dangerous? Turbulence occurs when there is a disturbance in air flow. An airplane rides on the wind, and if that flow of wind isn’t perfectly smooth, then the plane will shake or move up and down with the “bumps” in the wind. While some of us may feel more nervous about turbulence than others, understanding exactly what turbulence is, how pilots are trained to navigate it and how planes are designed to withstand turbulence can help calm your nerves. From why turbulence occurs to how pilots are trained to overcome it, here are 5 things to know about turbulence. Think of turbulence like waves in the ocean. Big or irregular waves can make for an uncomfortable boat ride, but aren’t necessarily dangerous. The same thing happens with a plane when flying through irregular winds. Shear: Shear turbulence happens when there are two adjacent areas of air moving in different directions. The border between them can be a turbulence hotspot. A common cause of shear is jet flow from another airplane. Thermal: Heat rises, so when it heads up through cooler air, you can end up with thermal turbulence. Mechanical: A large structure on the ground, a mountain, or other variation in the landscape can cause a sudden change in air flow. Over 8 million people fly every day, adding up to about 3 billion a year. Of those 3 billion, do you know how many people on average are injured by turbulence every year? 58 passengers. That’s 0.00000193% of flyers. And 2/3 of those are either flight attendants or passengers not wearing their seat belt when turbulence happens. When your pilot’s weather radar indicates possible turbulence ahead, your pilot will turn on the “Fasten Seat Belt” light above your seat. It’s in your best interest to pay attention to this light and buckle up when you see it. Your seatbelt is a powerful defense against any potential turbulence-related injuries. Your pilot isn’t just guessing — they turn on that light because they’re trained to understand the multiple factors that can lead to turbulence. Your pilot is an expert in more than how to take off, fly, and land (not that that isn’t impressive enough). Pilots are also trained in safety planning and navigation — including navigating turbulence. Before takeoff, your pilot has inspected the route and carefully analyzed the weather forecast and radars. If they see anything that could cause turbulence, your pilot will attempt to navigate an alternate route to avoid it altogether. In the case of inevitable turbulence, they’ll make sure the “Fasten Seat Belt” light is on, and that passengers are aware in advance of potentially more intense turbulence. At the end of the day, you should keep in mind that turbulence isn’t going to cause your plane to crash. Planes are built to withstand most turbulence. And in the case of more extreme turbulence, which would ideally be navigated around, your pilot is able to bring down the plane’s speed to a safe velocity, so your plane won’t be damaged it passes through the disturbances. This puts you at a very low risk of a turbulence-induced plane crash. The myth that private jets are less safe than commercial ones is just that: a myth. 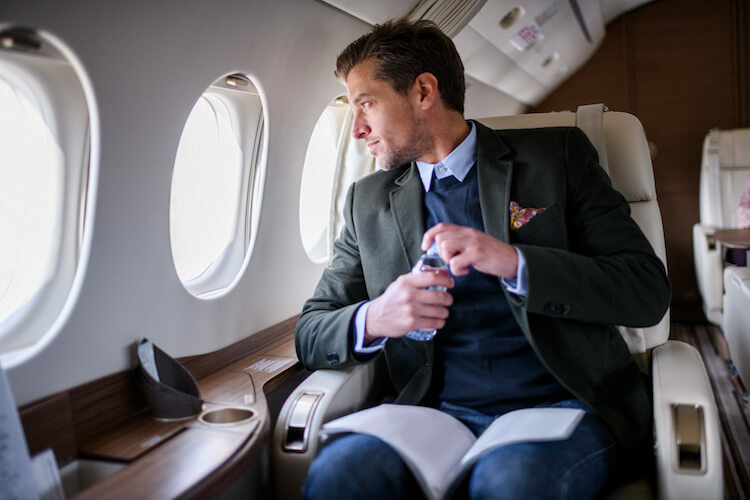 Private jet pilots are especially prepared for dealing with turbulence, as well as any other dangers thrown their way, as they are experts trained in flying, navigation and meteorology. Who Flys in Private Jets and How Do They Do it?